R.H. Codrington : Surfboards at Banks and Torres Islands, 1891. The Melanesians : Studies in their Anthropology and Folklore. Although the most brief of comments, Codringtons' note that in "the Banks' Islands and Torres Islands, and no doubt in other groups, they use the surf-board, tapa," is a significant report. Printed in 1891, the book is based on his experiences and notes from 1863 to 1867. Clearly he was aware of surfing, probably from reading the early accounts of explorers and missionaries such as Cook and Ellis, and his report is based on personal observation at two locations in, what is now, northern Vanuatu. His interest in Melanasian languages allows him to record their word for the surfboard, "tapa," resembling the Hawai'ian papa he'e nalu . "The Personal Article is e, but it is not used with men's names. It personifies a thing, e ja a person; e lololnew the surf-board swimmer." 1849 John Elphinstone Erskine : Lufi, New Caledonia. 1857 J.C. Patteson : Santa Cruz Islands. 1870 Unaccredited: Love In Fiji. 1898 Louis Becke : A Noble Sea Game. 1899 Mrs. Edgeworth David : Funafuti. 1900 H. Wilfrid Walker : Surfriding in Fiji. 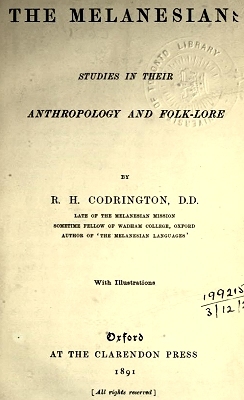 "R. H.Codrington was an Anglican priest and anthropologist who made the first study of Melanesian society and culture. His work is still held as a classic of ethnography. Codrington worked as headmaster of the Melanesian Mission school on Norfolk Island from 1867 to 1887. Over his many years with the Melanesian people, he gained a deep knowledge of their society, languages, and customs through a close association with them. He also intensively studied Melanesian languages, including the Mota language." IT has been my endeavour in the following pages to bring together the results of such observations as many years' acquaintance with Melanesian people has enabled me to make. I had once hoped to have been able to give something more like a full account of the beliefs and practices of the natives of those islands concerning which I have had the opportunity of collecting information ; but my stay upon my last return to the Melanesian Mission was too short for this, and I have now to put forth what I know to be very incomplete. My observations and enquiries were carried on, and my notes were made, in the years from 1863, when I first visited the islands, to 1887, when I left the Mission ; partly in the Melanesian Islands, but mostly in Norfolk Island, where natives of many of these islands have for many years been brought together for instruction. the Melanesians, and the social regulations and conditions prevailing among them. In conclusion, this book, though written by a missionary, with his full share of the prejudices and predilections belonging to missionaries, is not meant to have what is generally understood to be a missionary character ; but the writer is persuaded that one of the first duties of a missionary is to try to understand the people among whom he works, and to this end he hopes that he may have contributed something that may help. In the Banks' Islands and Torres Islands, and no doubt in other groups, they use the surf-board, tapa. Geoff Cater (2012) : R. H. Codrington : The Melanesians, 1891.